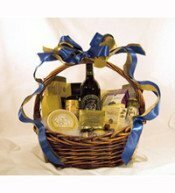 Wine Stars sweet and savory favorites fill this charming basket. 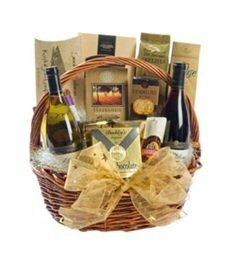 Wonderful Meritage wine, Truffettes de France truffles, Heart of Wisconsin mustard, Caffe Comfort coffee, S.S. Dunkle Caramel Popcorn, Bridge Brands chocolate, Kazilof smoked salmon, Aunt Gloria’s sesame water crackers, Gourmet Spread Brie Cheese, Oloves Tasty Mediterranean Olives. Pick any one, two or three bottle combinations from our website and add in this beautiful gift box + gift card. The box has a beautiful leather-like finish – black on the outside and cream colored on the inside, with a magnetic closure. Each comes with a decorative gold sleeve. Enjoy the classic wines from the Burgundy region American style – a bottle of Chardonnay and Pinot Noir, accompanied by tasty treats. 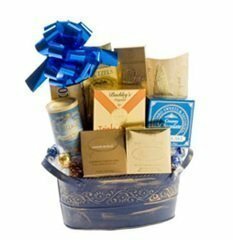 Kasilof smoked salmon, Olivos Gourmet Olives, Funky Chunky Chip-Zel-Pop, Bridge Brands chocolate, coffee, Aunt Gloria’s sesame water crackers, Mille Lacs summer sausage, Comfort Collections brie, East Shore Pretzels and mustard. Our lovely cozy collection is perfect for anytime! Snuggle up in front of the fire and enjoy the warmth of Café Comfort coffee along with your favorite treats – Bavarian pretzels, rich creamy fudge, Foley's Choco Mints, Funky Chunky Chip-Zel- Pop, Bridge Brands chocolate, Kasilof smoked salmon.